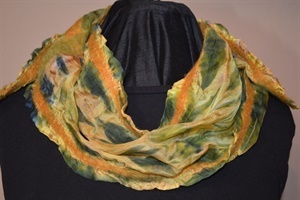 These one of a kind accessories are created using a variety of techniques such as shibori, fused felting, and hand dyeing using natural fabrics and fibers. 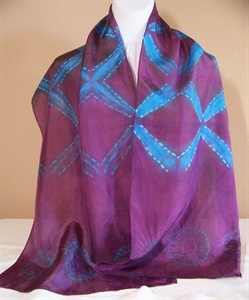 This category includes shawls, scarves, handbags and journal covers. 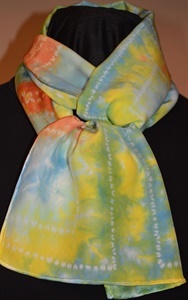 The pattern on this scarf is created using a stitched shibori technique and hand dyeing. 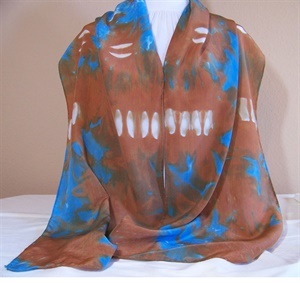 Silk habotai stitched shibori scarf/shawl. 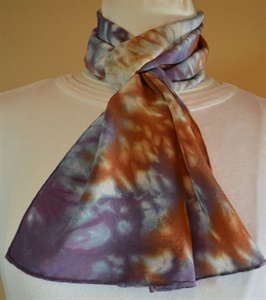 This is a generous size and provides lots of options for wearing in different styles. 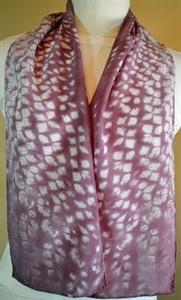 Silk crepe stitched shibori scarf/shawl. 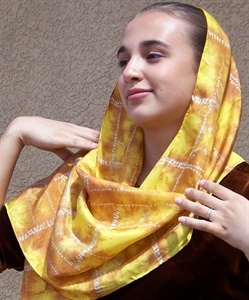 The generous size provides opportunities to wear it in many different ways. 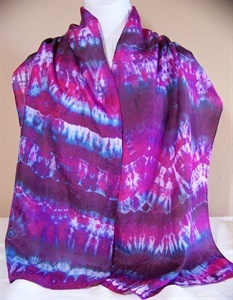 Hand dyed shibori silk habotai shawl or scarf - from the "fractal" series. 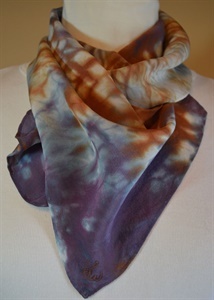 Lightweight silk crepe shibori scarf. 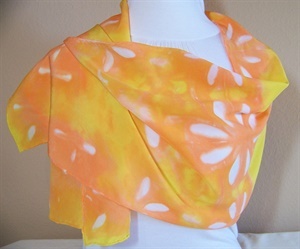 Silk habotai clamped shibori scarf/shawl. 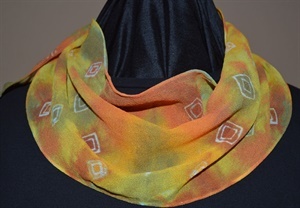 The generous size provides you with opportunities to wear it in multiple ways. 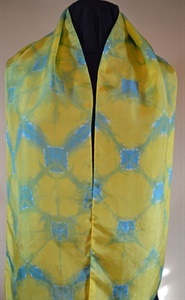 Silk habotai clamped shibori scarf/shawl from the "fractal" series. 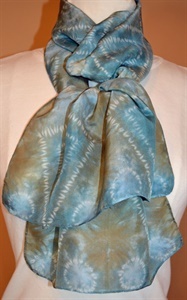 Silk and wool shibori scarf. This is incredibly soft. 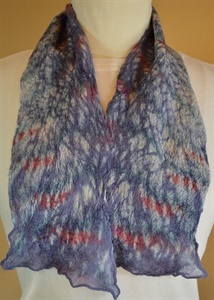 This is one of the softest scarves you will ever feel. 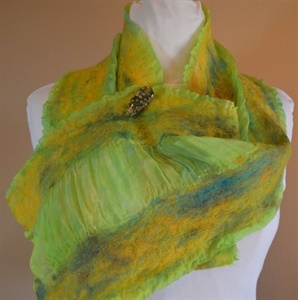 Fine merino wool and silk have been felted to a soft hand dyed silk organza. 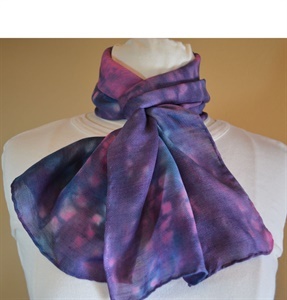 Comes with a beautiful flourite pin. 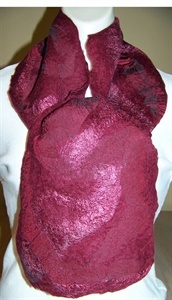 This scarf is incredibly soft. 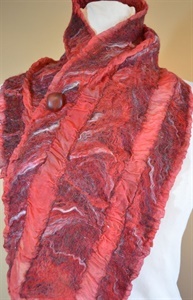 Fine merino wool and silk have been felted to a soft hand dyed silk organza creating the ruffles in the silk. 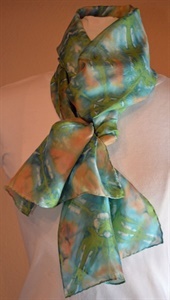 Comes with a beautiful pin. 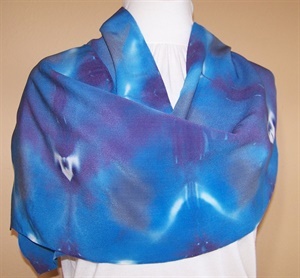 Hand dyed shibori silk crepe shawl or scarf. 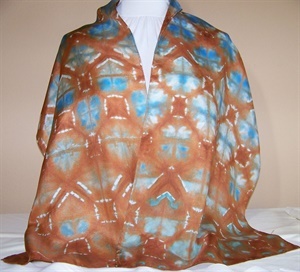 Hand dyed yanagi shibori silk habotai shawl or scarf. 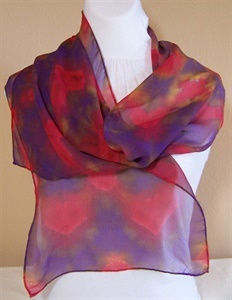 Hand dyed shibori silk crepe scarf or shawl. 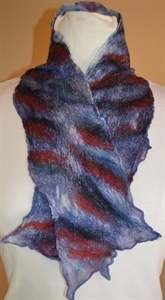 Merino wool, silk, and mohair fuse felted scarf. 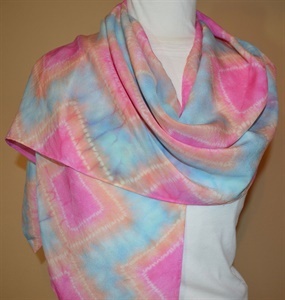 Incredibly soft and airy. 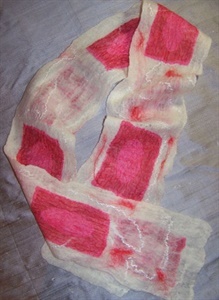 Wet felted scarf with nubby yarn embellishment. 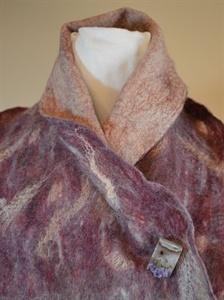 Created from merino and corriedale wool, silk and cashmere. 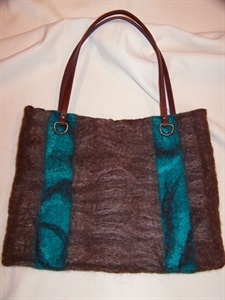 Wet felted merino wool, llama and silk roving handbag. 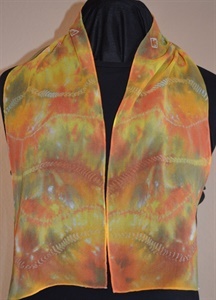 Fully lined with magnetic closure and 3 inside pockets. Leather handle with 7" drop. 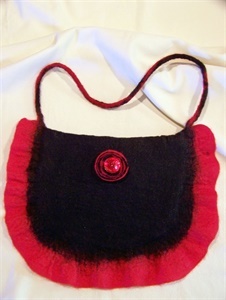 Wet felted black and red merino wool handbag. 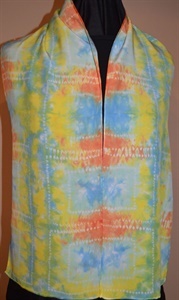 Front and back are identical. Pearlized buttons top felted wool rosettes. 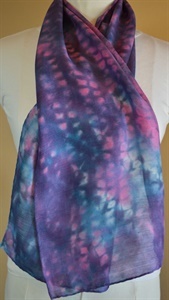 Fully lined with 2 pockets and magnetic closure. 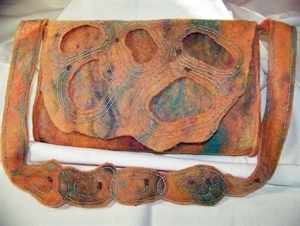 Although bag is 10" high, the inside is 7" deep. 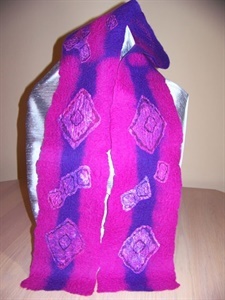 This scarf is incredibly soft. 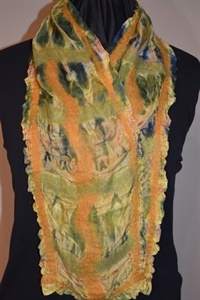 Fine merino wool and silk have been felted to a soft hand dyed silk chiffon hand dyed shibori scarf. 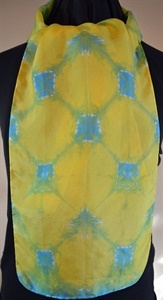 This photo is the reverse (scarf) side. 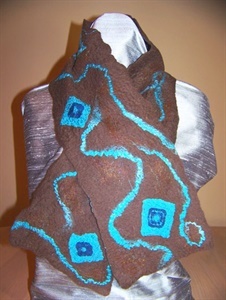 This scarf is incredibly soft. 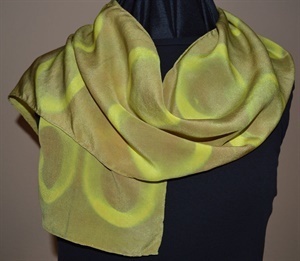 Fine merino wool and silk have been felted to a soft hand dyed silk chiffon hand dyed shibori scarf. 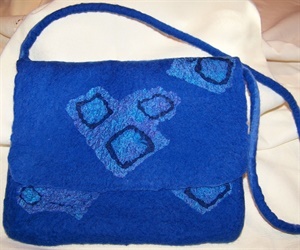 Nuno felted handbag of merino wool and silk. 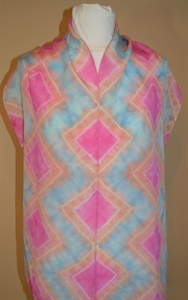 Cotton lining with pockets. 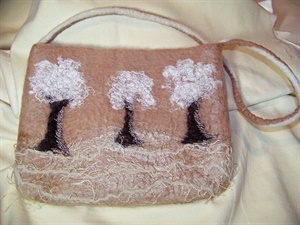 Felted, stitched and beaded handbag of corriedale wool, mohair and angelina fiber. 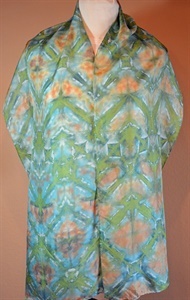 Cotton lining with inside pockets. Handle has 14" drop. 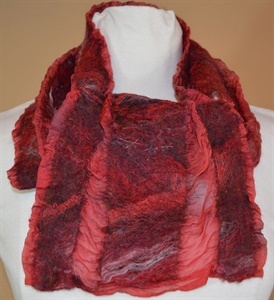 Fine merino wool has been felted to a hand dyed silk shibori soft organza.